Sustainable body care is an absolute no brainer, especially when it comes to caring for one's most intimate body parts. However, it took me a while to make the switch. It was a matter of ecological awareness and practical knowledge. Once I realized that my pads and tampons were forever sitting in a landfill, I wanted to make a difference. But I did not know how (even my doctor did not know about the DivaCup back in 2007!!). So it was also a matter of community--or lack thereof. I didn't know a single other woman who was interested in eco-friendly periods, much less actually using sustainable products herself. Happily, I can now report that there are several women in my life--and millions upon millions around the world--who have "green-ed" their periods. Ecologically-loving and female-empowering period supplies are becoming more popular and, thus, more readily available to all. Woot! I share this #QuickSwitch with the hope that it helps women who face the issues of awareness, knowledge, and communal support that impeded my steps toward sustainable feminine care years ago. "As my period wrapped up over the weekend I realized that the bathroom wastebasket was empty. This has been true for several years now. This time, however, I cheered. "Menstruation is a powerful experience of creativity. Of connectedness. I am thankful for the ways it rekindles my sense of womanhood. Through hormonal ebbs and flows, the entire menstrual cycle is an opportunity for self-discovery. I find that I am more easily in sync with how I really feel and what I really believe during different times of my cycle. In a world of mixed messages and 'fake news,' embodied truth--and learning to trust my body--is a blessing! "Did I just imply my bloody cycle helps me defeat lies and schemes of destruction in our world? I think I did. Let's just sit with that one for a bit. "When I saw that empty wastebasket I cheered for the fact that my period does no harm to the earth. In an instant I connected with the ways I have been made to feel shame in the past for my feminine "inconvenience" and got to revel in saying NO. Being female is not inconvenient or wrong or shameful. To be female is to bear the imago dei--it is connection with the blessed generative femininity in all creation and Creator." I have found a way to bleed in peace--with my convictions, with the earth, and with my own body--and this is liberation. I am thankful. This all might sound like a tall order, but trust me. What we do with our bodies determines the way we experience reality. The way we experience reality, in turn, impacts the way we engage others. Connecting with oneself enough to try sustainable period products is a paradigm-shifting move toward liberation--for the feminine and for the created world. The issue is really awareness. Tampax and Always are household names, murmured in hushed tones albeit. But have you heard of DivaCup, Luna Pads, or GladRags? Carry pesticides and leach chemical residues. "Disposables" are just not smart enough for women today. We do not have to settle. After the initial investment of time or finance—it depends on if you want to sew the pads yourself—sustainable period products cost WAY less than disposables. I’m talking a 4-figure difference over a lifetime. Say a woman menstruates for 40 years and needs an $8 pack of disposables every other month. That comes to about $1,920 over her lifetime. Double that if she needs an entire pack of disposables per month ($3,840 total). A set of 6 quality cloth pads run for about $80 and only needs to be replaced every 5 years or so. This route, then, would only cost a woman $640/lifetime of periods. If she were to use a $40 menstrual cup, the cost would be cut even more—you don’t have to use liners/pads as often when implementing the cup. I have spent approximately $105 on my period supply in the last 3.5 years. Well, to be completely transparent, my husband Aaron is actually the one who gave me the bulk of my bathroom caboodle. Yep, you read that right. My husband bought me sustainable period supplies for Christmas one year! SHAMELESS EXPRESSION OF DEVOTION: I treasure this man. I treasure his beautiful, feminist heart and his expansive, innovative mind. I am better because of his gracious spirit. I am literally healthier because of the way he cares for and cherishes my body, valuing my flesh as his own. The way he eschews the patriarchy—a system that would privilege his white, male body—in order to truly love me, himself, and our community continues to renew my faith in humanity. And turn me on. 2. GO TO THE LAUNDRY RATHER THAN THE TRASH. All you have to do is give your cloth or silicone a good wash and it is ready for your next wear. Non-treehuggers will often say that reusable products are wasteful because they require wash water. However, it takes more water to process disposables than a lifetime of laundry—and then the disposables get stuck in the ground somewhere, polluting groundwater and ocean life! Doing laundry is more responsible than making trash, period. 3. PROMOTE POSITIVE BODY KNOWLEDGE & FEMININE ESTEEM. Sustainable menstrual products honor female bodies. Instead of treating monthly bleeds like some kind of disease or disgusting wound, renewable menstrual supplies support the reality that periods are healthy, natural, and innate to most feminine experiences. Using cloth and cup—renewable matter rather than “disposable” matter—has done something to the way I understand and experience my flesh and my flow. It has helped me come to know more than ever that my body is good, miraculous, and very much alive; my monthly bleeds signify feminine health and vibrancy. As I phased out disposable bandage-like supplies from my regimen and stocked my bathroom trove with soft, washable accessories, I began to experience menstruation less like an ailment and more like a holy passage--an experience and expression of my core being. I lovingly settled into the rhythms of my body. I want to help create a world in which any woman who wishes can experience her body as a holy place of revelation, wonder, and creativity. The switch is very simple. Leave disposables behind and embrace the luxurious life of renewable period products. And then spread the word. The fabric pattern on my cloths are rather girlish, which is okay. They had the best reviews when I went looking a few years ago. That's why I went with them. However, there are SO many lovely fabric designs to choose from--have fun finding something you think is awesome! 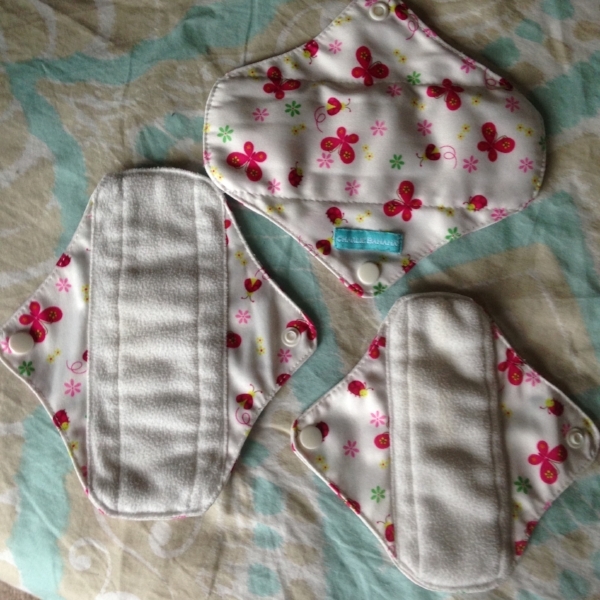 Cloth pads are soft and breathable. It is something I was not expecting, but there is a huge difference between having plastic-lined disposables and cotton cloth between your legs. Less irritation. I didn’t realize how chaffing conventional pads are until I tried cloth liners. Tip: If a pad is your primary line of defense, then I would definitely go big or go home. The small pads are great for light days or as backup for a menstrual cup. Because they “breathe,” this doesn’t feel like double duty, just security. Mediums are good for day-wear throughout the period. However, definitely spring for the overnight size (for overnight wear) if you are a pads-only user. I keep my liners corralled in an antique caboodle in my bathroom. During my period, used cloths wait to be washed in a little lidded bin. I give used pads a quick rinse with cold water in the bathroom sink before tucking them in the little lidded laundry bin. This helps keep stains to a minimum. Speaking of stains, you might be surprised with how few stains there are! Even my oldest cloths are clean and bright. When it is time to do laundry, conceptualize washing your reusables as you think about washing your underwear. Treat them the same way. I have used the DivaCup since the summer of 2013 (see closing story below). The instructions that came with the cup are explicit and easy to follow. They advise that it takes a good 6-months to get the hang of insertion. At first, I scoffed at this because I thought I had it nailed by day 2. Six months later, however, I realized that they were right. 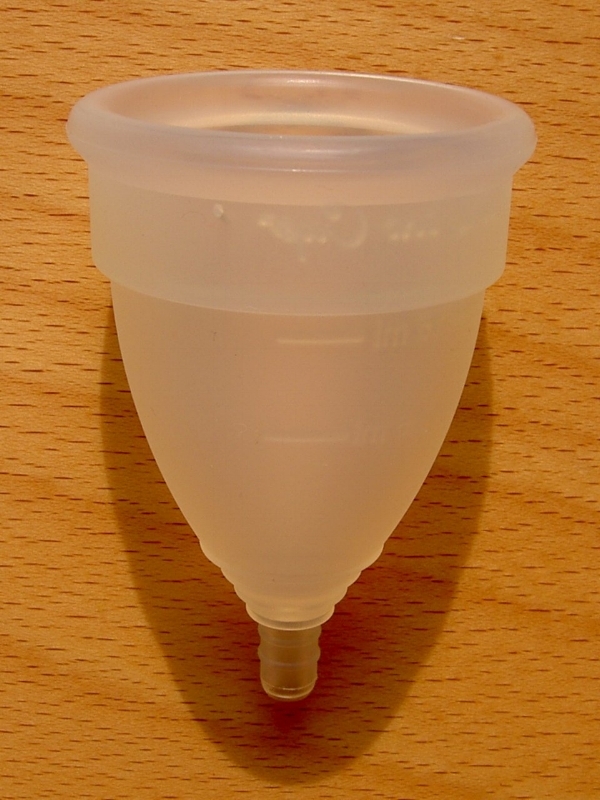 The menstrual cup is SUPER, but it does take several periods to become a pro. Be assured, though, that the adjustment is 100% worth the effort. They’re informative. The quality and character of your blood can tell you a lot about what’s going on in your body. I also find my blood less terrifying/gross/disturbing than before; the cup does away with “fear of the unknown.” Seeing the contents of my cup has helped me gather data that is helpful in conversation with my GP. Here's a breakdown of all the different types of cups--complete with reviews! Wash twice daily with hot water and pH-balanced soap. The bottle of DivaWash I got back in 2013 is still ¾ full. The soap is SUPER concentrated and, thus, lasts forever. Boil 5 minutes to sanitize after each period for clean storage. I have found that I need to replace my DivaCup once a year or so, but I have friends who have gotten up to 4-5 years of use out of theirs. It all depends on body chemistry. The good news is that silicone, which comes from sand, decomposes fairly quickly. DivaCup recommends cutting old cups into small pieces when it is time to dispose of them. This will hasten the decomposition process. Leaving the comfort of your nest is not a problem with sustainable products. All it takes is a quick shift of procedure. For cloth users, a "wet bag" is a must. Most cloth pad companies will send one with their products. They are washable and water-proof. When it is time to change your cloth, simply fold the used one and pop it into your wet bag. When you get home, open the wet bag and throw the whole thing into the wash (or into the special laundry bin). Cup folks have a bit more to wrap their heads around: How the heck do I empty, clean, and reinsert a menstrual cup in a public bathroom? It took practice, but now it comes easy. I have found that it is not necessary to wash the cup every single time I pour it out during the day (ALWAYS wash it once in the a.m. and once in the p.m.). When I am on the go and my body lets me know that the cup needs tending, I simply find a restroom, take care of business, wash my hands, and get on with my day. 1. Find a private restroom if you can. Single-seaters, as we call ‘em in my family, are good for those getting started with the cup. That way you have sink and toilet at your very private disposal. 2. Use toilet paper to tidy up the cup/your hands in the stall. When single-seaters are not available, remember that you can use toilet paper to your advantage. Simply give your cup a swab right there in the stall before reinsertion. 3. Take a deep breath. This is new and different. And it is better for your precious body and her beautiful planet, too. Remember that you are worth the effort of learning a new thing. As I mentioned earlier, I started using a DivaCup during the summer of 2013. It was the summer before Aaron and I got married, and I lived with two men in the basement of a Mennonite church building. Angelo, Codi, and I were farm ministry interns and we stayed in a little hospitality suite together below the bi-lingual preschool upstairs (yeah, it was an incredible church). Anyway, there I was trying to menstrual cup for the first time—and I shared a bathroom with men. The bathroom itself was weird. There were three private water closets with a toilet and shower each, but the sinks were all public. I was nervous that one of the guys would walk in while I was washing my menstrual cup one day, faint from exposure, hit his head on the towel rack, and promptly expire. And maybe, maaaayyyybe, I was still dealing with my own nerves and body-shame baggage. Of course he wanted to know. I told him what I was trying to do. Codi listened carefully—which is something he is pretty good at—smiled kindly and nodded. Anytime a friend looks you in the eye and says he’s proud of you is a good, good moment. But when he’s proud about something seemingly taboo but altogether righteous? You remember that moment and it helps set you straight on a few things. For the most part, your community is on your team. If you’re nervous about trying this quick switch, talk about it. Talk it out. Ask around. I bet you’ll find the help you need. I challenge you to share this post with three other women—either via Facebook or through conversation. Spread the word about eco-friendly periods! Deeply consider this idea: Female liberation through sustainable practice. Is there a connection for you between ecological wholeness and liberty for all? Contribute to the freedom of other women. Here is an amazing initiative for the dignity and peace of women and girls in South Africa. How do you care for your wonderful body? Are you just starting out on your journey to sustainable femininity? What are your questions, concerns, or curiosities? Are you farther along the sustainable journey? What has worked for you? What hasn’t? When it comes to making changes for a better world, sharing is definitely caring! Thanks for being here, beloveds. p.s. are you on my email list? Subscribe and For the Birds will come directly to your inbox--you'll never miss a post! I am a baptist, feminist, wife, urban homesteader, divinity school graduate, and pastoring woman. You will find all manner of chicanery pertaining to faith, home, and keeping the earth on this blog. I write to re-member myself--to connect anew with creation, community, and Creator. I also write to spark and spin ideas for a more sustainable and liturgical lifestyle. Sign up with your email address to receive latest posts directly! I will never share your information. Have a question? An idea? Take a second to say hello or leave a question on faith, home, and keeping the earth!